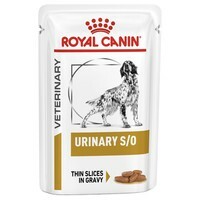 Royal Canin Urinary S/O Pouches for Dogs is a nutritionally balanced veterinary diet to help dissolve struvite stones that can cause urinary discomfort, and to help prevent their reoccurrence. Bought for my extremely fussy Jack russel x..she loves it. Can't fault this food.